The Reactor: Free Food From Fox for the New Fall Season! 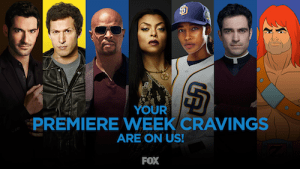 Fox is running a unique promotion this week, as they air the season premieres of many of their most popular shows. If you tweet a specific combination of hashtags and emojis to the correct address, you’ll have the chance to win a free food delivery during the show. May your hunger be ever satisfied! This is the full list of show premieres, as well as the necessary tweeting information. Further details on the promotion and rules can be found by clicking here. Are you planning on tweeting during these shows? Join the conersation on FoCC!